Mens Salons Just Got Better! Beer in Mens Salons Not Just For Fun! I imagine you’ve noticed the mens salons popping up nationwide, from franchised versions to the revised and updated down home barbershops. Mens salons are back with a vengeance and I’m glad to hear it! Guys have needed a place to go that caters to their grooming needs and life style interests. It was already 4 years ago that I posted this article “Mens salons have a big future” which includes a LA Times snippet of a man who saw the market for new mens salons and within 4 years time opened, Major League Trim . . . great name! He was a pioneer in introducing the modernized barbershop including barber stations, each with its own 13-inch TV with access to cable sports stations. “Mens Salons Inovating With Beer” Since that time there have been many mens salons that have cropped up with services including, scalp and hand massages, hot towel straight edge shaves, shoe shines, manscaping (shaving or waxing off excess hair) and the sale of mens skin care, hair products, sports paraphernalia and even cigars!But recently I heard of the newest mens salons service menu offering, The Beer Rinse . . . Brilliant!! There are mens salons that serve the occasional beer or wine to their clients but, A mens salon in New York City has improved on the concept by offering a beer rinse as a hair service. Using beer as a rinse for the hair isn’t new, but it is new in some salons as a service to add shine and make hair appear thicker. 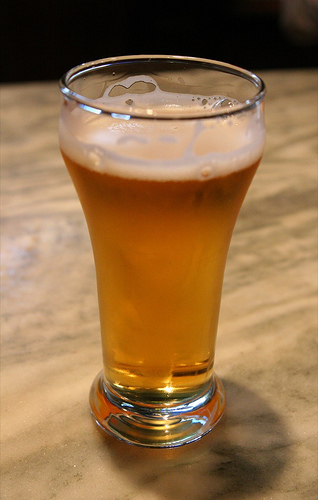 Supposedly, real brewed beer contains vitamins and proteins that nourish the hair and add body and texture to hair. It’s also said to have an acidic quality that strips the hair of product buildup and contains added sugars that tightens the cuticle for extra shine. I haven’t tried it, but If you want to try a “beer rinse” treatment at home, open a bottle of brew, take a few sips and let it sit on the counter to become flat and room temperature. Simply shampoo and rinse as usual. Pour remaining bottle of on hair and massage in. Rinse thoroughly with cold water. First, mens salons brought in flat screen TV’s with sports, ESPN and cigars, and it keeps evolving. Now ‘beer’ is served as a relaxing beverage AND as an old hair remedy revisited. December 2, 2012 By: Barb Quinn Hairstyle Blog Leave your comments (0), Your input matters. Everyone has heard the saying: “You never get a second chance to make a first impression.” In today’s competitive world it is more important than ever to look your best at all times. You never know who you are going to run into and how it may affect what you are trying to accomplish in your life. We are all at various stages in our lives. You could be looking for a job, a mate, or have a current job where you are easily recognizable. This is why it is more important than ever to be prepared for a chance encounter. Another well known, but often forgotten fact is the better we look and feel, the better we perform. Hair: Make it a point to always keep a well groomed and maintained haircut. Getting a haircut often does not mean you have to wear your hair short. It just means you will always keep your chosen style up to date. Clean your face with a moisturizing soap or face wash. Hold a warm wash cloth or small towel on your face for 30-60 seconds. Massage light oil on your face. You can use expensive pre-shave oil or something as inexpensive as baby oil. When you shave you scrape away the natural oil in your skin so it is very important to add oil before shaving. This cuts down on razor burn and softens the beard. Use a warm, moisturizing, shaving cream. If you put a cold gel or cream on your face it will close the pores and cause the beard to lie down. This will cause you to have to press harder with the razor which will result in razor burn. Rinse your face off with cold water to close the pores. Apply an aftershave moisturizer with Shea butter. This is an anti-inflammatory and will soothe the skin helping to avoid razor burn. Casual Clothing: Most important always be wrinkle free. You never want to look like you slept in your clothes or took them out of the hamper. When wearing sneakers or casual shoes make sure they are clean. Dress/Formal Clothing: Always wrinkle free. Make sure your shirt is tucked in and tie centered with a perfect tie knot. Keep your shoes shined so clean they look like they just came out of the box. Guest author Master Barber Greg Zorian is a third generation barber, educator and manager of several successful barbershops. Greg is in high demand as a barbering instructor and workshop leader. Greg’s work has been featured in Milady’s Standard Professional Barbering textbook and DVD series as well as many national and international publications including Travel and Leisure Magazine and Four Seasons Luxury Travel Magazine’s “Top 5 Haircuts in the World” category. November 26, 2012 By: Barb Quinn Hairstyle Blog Leave your comments (0), Your input matters.